With polished armor glinting in the sunlight, the armies of the twelve banners and the Free Cities are a stirring sight. Master wizards from the circles of Greyhaven and Nerekhall bolster their ranks, wielding destructive power and an arsenal of runebound shards to devastate their foes. Battle standards with histories as long as the Baronies of Daqan swirl in the wind, while the roar of lion horns stiffens the backs of wavering soldiers. Every company is led by a champion, one who has faced death time and again yet has survived and now invites others to draw strength from his own stolid bravery. 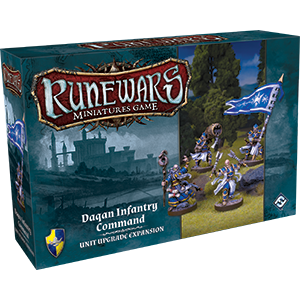 The Daqan Infantry Command Unit Upgrade Expansion introduces four brand-new figures to the armies of the Daqan Lords – a Banner Guard, a Wizard, a Champion, and a Cornicen. Alongside these figures, you’ll find eighteen new upgrade cards, many of which include ways to bring these new figures into your armies. For instance, you may choose to support one of your units with the Lance Corporal upgrade card, implanting the Champion figure into the ranks of your unit. As long as the Champion figure is alive, you gain the benefit of the Lance Corporal card, which significantly boosts your tactical flexibility!